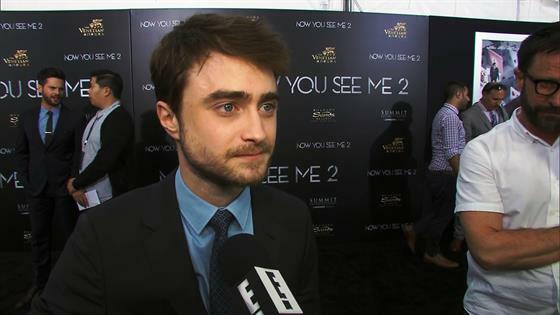 Daniel Radcliffe Not Watching "Harry Potter" Play? There's no question that Daniel Radcliffe is grateful for his time in the Harry Potter franchise. But as preview performances of the upcoming London play Harry Potter and the Cursed Child kick off next month, the beloved actor is hesitant to attend for a very thoughtful reason. "It would be a weird one. I could be completely wrong in this, but I feel like if I went to see it that night, there's going to be a lot of Harry Potter fans there in the audience obviously and would that then become a thing?" Daniel explained to E! News at the New York City premiere of Now You See Me 2. "Would it be more about them watching me watch the show or would it take away from the show. I would never want to do anything that would distract or take away from the show." He added, "I don't know. I'm busy doing a play here at the moment, but I'm not sure." Another important job taking up the actor's time is supporting his latest film opening in theaters Friday. Now You See Me 2 reunites the four horsemen who are recruited by a tech genius to pull off one difficult heist. Movie Premieres: Red Carpets and Parties! As for the upcoming Harry Potter play, acclaimed author J.K. Rowling recently requested any and all muggles to obey one simple rule: Don't spoil any big news for other fans. "You've been amazing for years at keeping Harry Potter secrets so you don't spoil the books for readers who came after you," she explained in a YouTube video. "So I'm asking you one more time to keep secrets and let audiences enjoy Cursed Child with all the surprises that we've built into the story." She added, "Potter fans have always had each other's backs." Slated for debut at the London Palace Theater, the stage production chronicles the life of the series' beloved protagonist Harry Potter as an "overworked" employee of the Ministry of Magic and his son Albus Severus Potter 19 years after the last book finished. Preview performances are slated to begin on July 7 with a printed version of the play scheduled to be released at the end of the month.